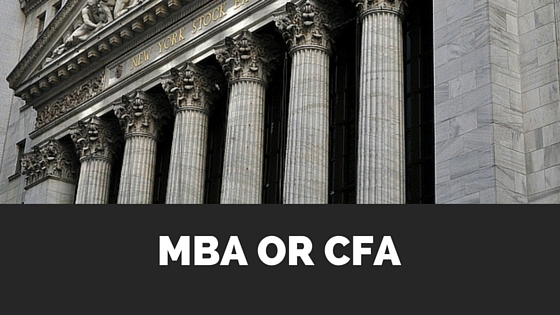 Home > CFA vs MBA – which one should you pursue? CFA vs MBA – which one should you pursue? For every person, working in Dalal Street, there comes a time when he starts thinking about his career growth and enhancing his investment skills. For a majority of them, this question has two answers. To do an MBA in Finance and continue job in financial sector or opt for CFA or Certified Financial Analyst and grab a high paying job. Though objective of both the courses are same, process and methodology are entirely different. Each course has its own pros and cons. A MBA is generally centered on General Management and Introductory skills of domain one majors in- Finance, Marketing, HR or Operations. One can become expert in field only after working for some years. A Certified Financial Analyst certification, on other hand, is more niche course. Charter holders of CFA are actually investment professionals, and the skill set they develop through CFA is stock picking strategies, financial markets functioning and analytics. They target on becoming Fund Manager, Hedge Fund Manager, Financial Consultants etc. and deal with investments like securities, currency and real estate. A Regular MBA is a broader program, which consist of general management courses and about 10 electives (papers) of specialization you chose. IIMs offer no specialization but general management MBA only. While, XLRI and XIMB offers only specialized MBA and not general management. Not to mention, MBA is generally a fully residential course that requires you to live in campus and attend classes every day. On the other hand, a CFA course is highly specialized, requires a student to go into deep study of investments and develop skills of becoming a financial expect, further specializing in a sub-area within finance like shares, mutual fund, insurance, taxation etc. CFA is a distance education course, which means a student is provided with all study materials, and he enrolls for 3 levels of exam according to his convenience. One can however take coaching to prepare for different level of exams. There is no fixed duration of competing CFA, but one would require a minimum of 3 years to complete it, if he takes and clears each level continuously. The craze towards CFA increases just because they are less in number (about 1,00,000 CFA charter holders across the world as of Jan, 2015) and specialized financial skills. CFA is generally considered much cheaper than MBA. CFA requires one time registration fee of about $ 750 and subsequent exam fee in range of 1000-1500$, depending on how early you register for the test. Of course they offer scholarship for needy students. In total, CFA would require a minimum of about 4000$ or about Rs.2,50,000 investment and if you register late or take extra coaching, extra cost would be added. And, when it come for MBA from leading B Schools of India, you may have to shell out in range of Rs. 12 Lakhs to 20 Lakhs, depending on College including IIMs (FMS & a few are exception). The CFA Institute recommends a student to study minimum 300 hours before appearing for any level test. It becomes a grueling course, given the fact that CFA students are professional also and rarely quit their job. Level 1 Test takes place in December and Level 2 and 3 in June, every year. That means if a student is lucky enough, he can complete the course in 2.5 years. But, the conversion ratio of appeared students to passed students is around 30-40 % for last 3-4 years. That means it can take 3-4 year for a student to become a CFA charter holder. While it takes 2 years to complete a regular MBA in India. It can take more if you have opted for part time MBA. An MBA from abroad can be completed within 1.5-2 years. MBA offers broader job opportunities. An MBA can join in a variety of industries, from agriculture to e-commerce and finance to manufacturing. He can become an all weather manager and switch his job more smoothly. One can easily get jobs in all types of companies, from MNCs to startups and every where on earth, towns and cities alike. On the other hand, CFA is a more seasoned. CFA charter holders have to compulsorily work within BFSI sector and in particular investment division. Their jobs are confined to top financial districts of the world-London, New York, Mumbai etc to name a few. CFA being a niche network of investment professional attracts much better salary than MBA. PayScale, an independent compensation research firm quotes median salary of CFA charter holder of about Rs.6,00,000 ( read for more www.payscale.com/research/IN/Job=Chartered_Financial_Analyst_(CFA)/Salary) while that of MBA as Business Development Manager as Rs. 5.8 lakhs (Read for more http://www.payscale.com/research/IN/Job=Business_Development_Manager/Salary). The salary contrasts more, if we take into consideration experience and if working abroad. So, ultimately, which course to opt for depends on what you need? If you want a rich and awarding career in Financial Industry, CFA is right course for you, though it requires much extra efforts. If you are flexible with your job role and want a smoother life for academic and career progress, an MBA is right for you.